Cities are at the forefront of immigrant integration in Europe. As the initial point of contact for most immigrants, cities see firsthand how both local and national policies affect newcomers and minorities. However, while the significant role of city policy in integration has been increasingly recognized, there is still much incongruence and contradiction between national and local visions and policies in this arena. National governments do not always seek to work with cities on integration policies, despite the importance of city-level policy. And multilevel governance challenges have emerged in three areas in particular: integration programs for newcomers, efforts to support social mobility, and policies to address segregation. 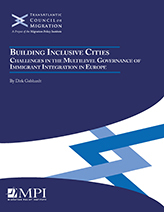 This report explores what some cities are doing to be more inclusive of immigrants and minorities, drawing on examples of initiatives from key destinations across Europe, and how these relate to national policies. Cities in Europe play an integral role in reducing obstacles to social mobility and addressing the particular integration challenges immigrants face in a given locality. But their efforts can be hampered by national legislation, which is often poorly coordinated with local policies and too inflexible to respond to local needs. Given the significant financial investment that integration measures represent for national governments, this lack of coordination—or in some cases, lack of national policy altogether—is a major impediment to efficiency. This report was commissioned for the eleventh plenary meeting of MPI's Transatlantic Council on Migration, which focused on how cities and regions can more fully reap the benefits of immigration.